Yeah, it’s this time of the year that Christians all over the world celebrate the death and resurrection of Jesus Christ who is considered the center of the Christian Faith. To me, Easter is about celebrating the fact that God in all his glory and majesty left his heavenly throne to die for my sins. He did not have to do it, but he did and His motivation was LOVE as stated in John 3:16(For God so loved the world that he gave his one and only Son, that whoever believes in him shall not perish but have eternal life). When Adam sinned against God and was consequentially thrust out of the garden of Eden, God is all His wisdom and love had a plan to redeem man kind from sin so as to restore a broken relationship. This was made possible through one man’s (Jesus Christ) righteous act. Now you can have Life everlasting if you accept the FREE gift of salvation through faith in this man. You don’t have to do anything to attain or earn it except to believe! That’s what easter is all about. Now here are some of the [free] tools some of which I have personally used that can make you Easter and even other days fulfilling. esword is an incredible desktop bible software that you can freely download (http://www.e-sword.net/) and install on you PC. 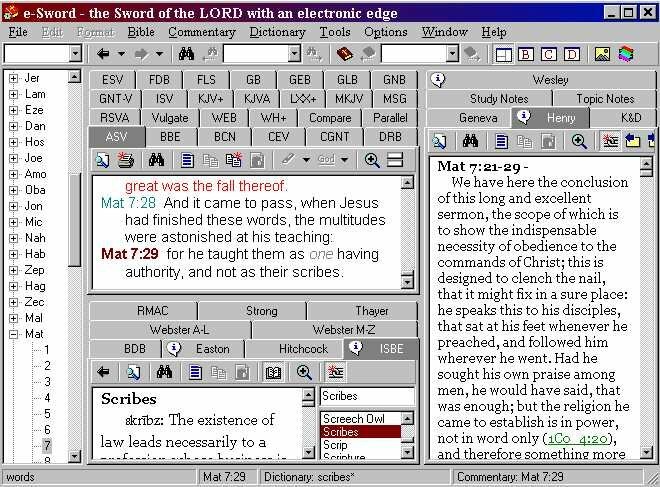 eSword was created by Rick Meyers in 2000 as a free Bible programme running on Windows 98 OS (or better). Later a version for Pocket PC was developed as well. The programmes are freeware, but not open source. Biblegateway is a website designed to allow easy searching of the Christian Bible in many different versions and translations, including Spanish, French, and other non-English languages (see below). The website is free for anyone to use. BibleMaps is an incredible online resource for navigating through the ancient places or cities of the bible times. Biblemaps.org is a google maps mashup or uses google maps to enable you search or navigate through the ancient cities like Ur where Abraham came from before he was called by God, babylon, Antioch, Asshur, Assyria, Bethel, Bethlehem, Canaan, Capernaum, Cush, Jericho, Jerusalem, Jordan, Samaria, Shalem and the list goes on. Our Daily Bread is a devotional calendar-style booklet published by RBC Ministries in nearly 30 languages. The booklet is one of the most widely read Christian devotionals in circulation today. The booklet was first published in April 1956, and includes writing about the Bible and insights into Christian living. However, the there is also an online version of these wonderful devotianals that you can read every morning for the nourishment of your spirit. If you the kind who loves listening more and probably have a computer with an internet connection or a media player like an ipod, then there are a couple of wonderful podcasts by various reknown preachers all over the world like Creflo Dollar, Joyce meyer, Bishop T.D jakes, Pastor Chris Oyakilome of Christ embassy. There are some podcasts by watoto Church too. It’s a matter of going to you itunes and clicking on podcasts then type any of the above keywords in the search box. That’s it, if there are any that you know, please feel free to share.